The third round of the 2016 MRF MMSC FMSCI Indian National Motorcycle Racing Championship has commenced at the Madras Motor Racing Track today. 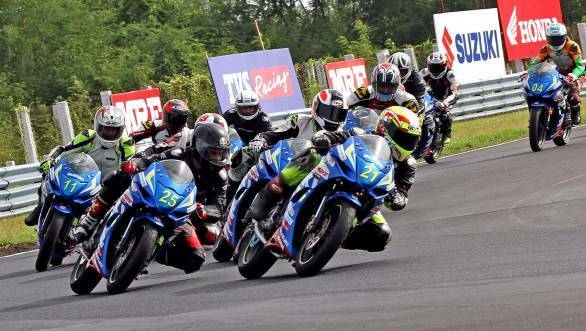 The event, with qualifying and races held over the course of the next two days includes three premier classes of the championship - the Super Sport Indian (165cc and 300-400cc classes), Pro-Stock 165 and Stock 165cc classes. In addition to the premier classes of racing, there are also a host of one make championships being held. This includes the Honda One Make Races - the CBR 150 and CBR 250 Cups, the TVS Apache RTR200 race and the Suzuki Gixxer Cup. Support races include the Superbike (600-1000cc) category, the Honda Ladies Race and the race for the women riders in the Alisha Abdullah Racing Academy. The races that will get the most attention this weekend will be the Super Sport Indian class, with the combined 165cc and 300-400cc grids. The riders, the likes of TVS Racing's Jagan Kumar, Honda Ten10 Racing's Sarath Kumar and Team RACR's Rajini Krishnan, are all in the reckoning for a race win. And the results of the race could have a definite bearing on the championship. The 165cc championship sees K Jagan in the lead, with 18 points over Deepak Ravikumar. In the Pro-Stock category, it is Hari Krishnan of Honda Ten10 Racing, at the head of the order, having won all four races this season. Antony Peter leads the Stock 165cc class, for rookie racers.